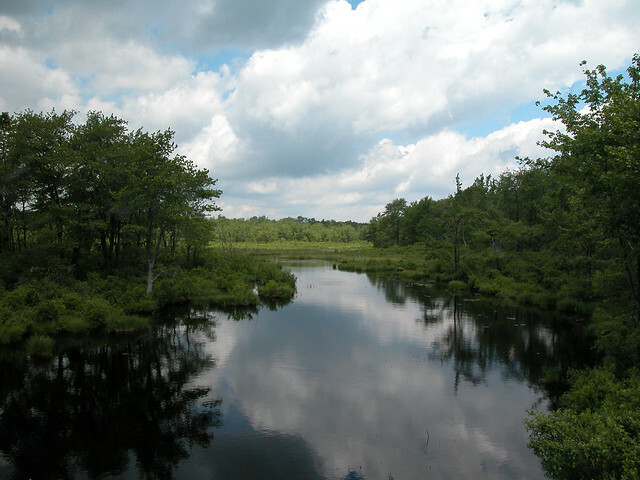 Tobyhanna State Park is in scenic Monroe and Wayne counties in northeastern Pennsylvania. The 5,440-acre park includes the 170-acre Tobyhanna Lake. Tobyhanna is derived from an American Indian word meaning “a stream whose banks are fringed with alder.” Gouldsboro State Park is nearby. Visitors using more remote and undeveloped areas of Tobyhanna State Park should be aware that they could encounter old, unexploded artillery shells. Three types of shells have been found in the park. The largest projectile is 18 to 24 inches in length and about six inches in diameter. The medium projectile is 2.5 inches in diameter and from 10 to 14 inches in length. The smallest projectile is three inches long and 1.25 inches in diameter. Shells are found in severely rusted condition without any recognizable markings or imprints. Their overall appearance is that of a pointed cylinder of rusted steel. Visitors encountering such items should not touch, attempt to move, or otherwise disturb the items, and should call the park office to report the location for proper disposal. The park office is open specific hours. The beach, overnight areas, and other areas are open specific seasons and hours. Contact the park office for facility seasons and hours. The park entrance is 2.1 miles north of the community of Tobyhanna on PA 423. PA 423 intersects with I-380, 2.5 miles south of the park entrance. The park can also be reached from Interstate 84 via PA 507, PA 191 and PA 423, a total distance of 11.4 miles. Call 911 and contact an employee.